This pattern swells and rocks just like the ocean on a rocky shore. There are only enough specialty stitches in each section to get a taste of each type of specialty stitch, so please don’t let them intimidate you! 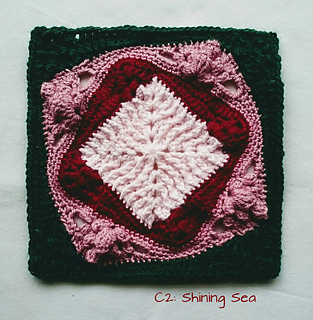 Naming patterns is rather difficult, and I had my heart set on Shining Sea, only to discover I’d already named my (only) knitting pattern with the same title. 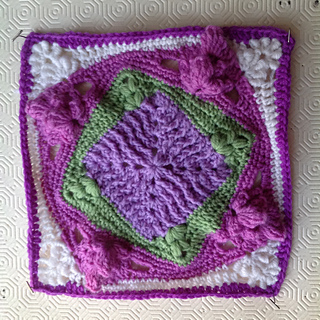 Rather than try to think up yet another name, I decided to add a (crochet #2) to the front. I would also like to extend an excited thanks to the 2017BAMCAL group for the honor being invited to design for them three years in a row. I hope everyone enjoys this pattern as I had a lot of fun designing it. Please feel free to ask questions there or on my own help thread.